The first comprehensive report documenting hate violence and xenophobic political rhetoric aimed at South Asian, Muslim, Arab, Sikh, Hindu, and Middle Eastern Americans during the 2016 election cycle. This new report examines the dramatic demographic growth of South Asians across the United States, particularly in the South, and reveals how increases in population are met with increases in intolerance during the most divisive Presidential election in modern American history. A Rights Working Group shadow report in which SAALT and other organizations collaborated. The shadow report addressed the many forms of racial profiling as they affected individuals across all races, ethnicities, gender, age, religion, and sexual orientation. In the wake of reports of surveillance of Muslim communities by the New York City Police Department, it is important to recognize that Muslim, Sikh, and South Asian communities have been the targets of suspicion by state & national law enforcement agencies for the past decade. The results of a recent documentation project confirm that South Asians endure heightened scrutiny without any evidence of wrongdoing. The impact is severe, affecting community members’ personal lives and sense of identity, as well as basic decisions regarding livelihood, worship, and education. 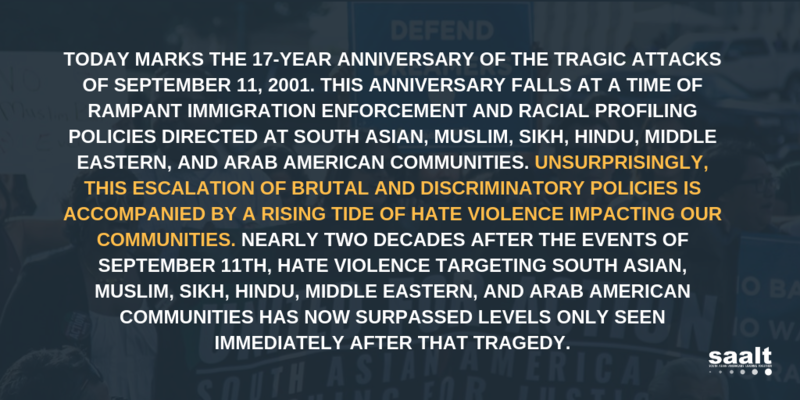 SAALT’s report about presents the stories of success, resistance and resilience of individuals, organizations and communities in the decade after September 11th. SAALT’s report about the rise in racists, xenophobic and Islamophobic rhetoric in political discourse, and how it impacts political participation and civic engagement. SAALT’s Deepa Iyer and Priya Murthy recently published an article called Courting The South Asian Vote: One Step Forward, Two Steps Back in the Winter 2009 edition of the St. John’s Journal of Legal Commentary. The piece presents a case study of the pattern of “othering” faced by South Asian Americans in the United States by examining xenophobic rhetoric in political discourse. Iyer and Murthy argue that even as South Asian civic participation is on the rise, such racist and xenophobic rhetoric can limit the full and equal participation of South Asians in the American political process. In response to the lack of information about the South Asian community in the Washington DC metropolitan region – home to the nation’s fifth largest South Asian population – APALRC and SAALT launched the South Asian Community Empowerment (SACE) project in early 2009 that included a multi-language needs assessment, focus groups, interviews, and relationship-building with community organizations. Washington DeSi: South Asians in the Nation’s Capital provides findings from surveys of nearly 200 South Asians living or working in DC, as well as trends gathered from focus groups and interviews. This report was developed through the generous support of the DC Mayor’s Office on Asian and Pacific Islander Affairs. This report provides critical insights into the needs and opportunities faced by organizations serving, advocating for, and organizing South Asians in America. Building Community Strength synthesizes the results of a needs assessment and interviews with 31 community-based organizations serving South Asians around the country, while highlighting best practices and recommendations for stakeholders to better assist South Asian organizations – and by extension – South Asian community members. The report, made possible through support from the Citi Foundation, includes examples of best practices used by South Asian groups, and recommendations to guide further research and action. We hope that organizations, community members, grantmakers, and stakeholders will use the report as a tool and resource to increase awareness of the South Asian community; to garner additional resources; and to access policymakers. The purpose of this report is to document an ugly, but nonetheless important, section of American history. News accounts of the tragedy are justifiably replete with stories of heroism, courage, and strength in the wake of the September 11 attacks. News of the backlash, however, was not widely reported, especially in the national media during the first week after the attacks. Most news accounts merely repeated the same horrific incidents of backlash, giving the impression that it was limited to a few, isolated incidents scattered around the country. The reality, however, was that bias incidents were far more widespread than were reported. These fears were captured more accurately in stories reported by local press which form the foundation of this report. Rather than let these local stories slip into obscurity, this report is designed to compile the stories to provide a more accurate picture of American reaction to this tragedy. This report sets forth issues affecting the South Asian community and provides recommendations for policymakers, community-based organizations, stakeholders, allies, media, and the general public. A National Action Agenda is a product of the National Coalition of South Asian Organizations (NCSO), a network of groups around the country that provide services to, organize, and advocate on behalf of South Asian communities, and individual experts and advocates in various fields. A National Action Agenda includes the following components with detailed recommendations: Civic and Political Participation, Civil Rights and Civil Liberties, Data Collection, Economic Justice, Gender Equity, Health Care, Immigrant Rights, LGBTIQ Rights, and Youth Empowerment. A Demographic Snapshot of South Asians in the United States (December 2015) South Asians have grown at a rapid rate in the last ten years, growing in both metropolitan areas and immigrant gateway centers. over 4.3 million South Asians live in the United States today, and comprise the second largest Asian ethnic group. South Asians are becoming an increasingly powerful and robust segment of the American electorate. Cheat Sheet: Contains plans, statistics and policies. SAALT and APALRC’s guide to Montgomery County’s resources on health care, unemployment insurance, housing, and other social services – available in: English, Bangla, Urdu, and Hindi. SAALT has developed 3 issue briefs that highlight the impact of racial and religious profiling on the South Asian community. Read the briefs on surveillance, travel and immigration. During the summer and fall of 2009, Congress and the Obama Administration have been focused on reforming the country’s health care and insurance systems. Many South Asians living in the United States would be affected by changes in health care and health insurance policy. SAALT has developed two resources pertinent to the national dialogue on health care reform.“What You Need to Know About the Health Insurance Reform” answers questions about the debate; includes basic definitions for terminology; and provides ways for South Asians to get involved in the discussion. “Health Care Issues Affecting South Asians in the United States” provides information and resources on health issues impacting the community. Check out this new informational guide on citizenship for the South Asian community which will assist immigrants in understanding the changes and requirements of the naturalization process. This guide provides answers to frequently asked questions about how the naturalization process works; obstacles faced by South Asian applicants; the content of the new naturalization exam to be implemented in October 2008; and information to assist elderly immigrants seeking naturalization. Developed through the generous support of the Murthy Law Firm, this brochure is the first in a series of immigration-related resources that SAALT will be producing this year.